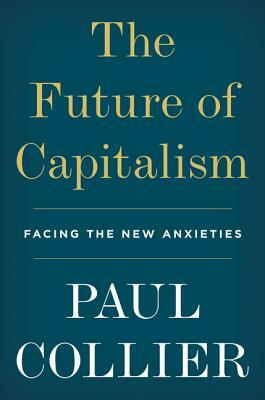 From world-renowned economist Paul Collier, a candid diagnosis of the failures of capitalism and a pragmatic and realistic vision for how we can repair it. Deep new rifts are tearing apart the fabric of the United States and other Western societies: thriving cities versus rural counties, the highly skilled elite versus the less educated, wealthy versus developing countries. As these divides deepen, we have lost the sense of ethical obligation to others that was crucial to the rise of post-war social democracy. So far these rifts have been answered only by the revivalist ideologies of populism and socialism, leading to the seismic upheavals of Trump, Brexit, and the return of the far-right in Germany. We have heard many critiques of capitalism but no one has laid out a realistic way to fix it, until now. In a passionate and polemical book, celebrated economist Paul Collier outlines brilliantly original and ethical ways of healing these rifts—economic, social and cultural—with the cool head of pragmatism, rather than the fervor of ideological revivalism. He reveals how he has personally lived across these three divides, moving from working-class Sheffield to hyper-competitive Oxford, and working between Britain and Africa, and acknowledges some of the failings of his profession. Drawing on his own solutions as well as ideas from some of the world’s most distinguished social scientists, he shows us how to save capitalism from itself—and free ourselves from the intellectual baggage of the twentieth century. Paul Collier is the Professor of Economics and Public Policy at the Blavatnik School of Government. He is the author of The Bottom Billion, which won the Lionel Gelber Prize and the Arthur Ross Prize awarded by the Council on Foreign Relations, The Plundered Planet, Exodus and Refuge (with Alexander Betts). Collier has served as Director of the Research Department of the World Bank, and consults with the German and many other governments around the world.